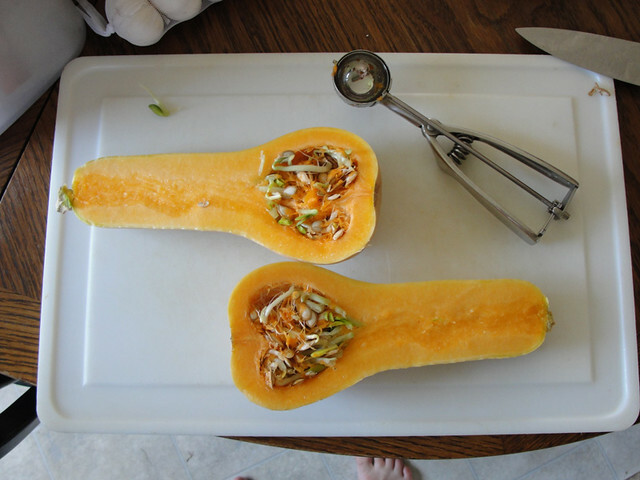 I cut open this butternut squash a few weeks ago to a wonderful surprise--sprouts! After sitting on my counter for several weeks, it must have decided it had had enough sunshine to rev up the next phase of the life cycle. I had grand plans of planting the sprouts and growing squash through the winter (indoors, of course). Those plans ended in a mass of black, squishy rot, since first of all I thought I would keep it in a plastic bag "until I had the time to deal with it." Apparently, "Time" made that decision for me. Lady Time seems to be holding a few other Rods of Doom over our heads these days, and we are working hard to make sure they don't land. Jason has been valiantly working away on erecting and connecting the diesel fuel tank for our furnace all weekend, but has met with several setbacks that have made the project stretch out in the most maddening way. I also got some poles for my new, "permanent" chicken run tamped in tonight. Two down, fourteen more to go! And my back is already feeling it. It sounds like Jason will be staying home tomorrow to continue working on his projects while the weather is good. I may only do school in the morning with the boys for the same reason. We intend to beat Time to the punch, if it is at all possible! How was your weekend, friends? Go, go, go!!! You CAN do it! !